We love everything from Lobo brand, the products are so tasty and capture authentic Thai flavors perfectly with easy-to-prepare methods. 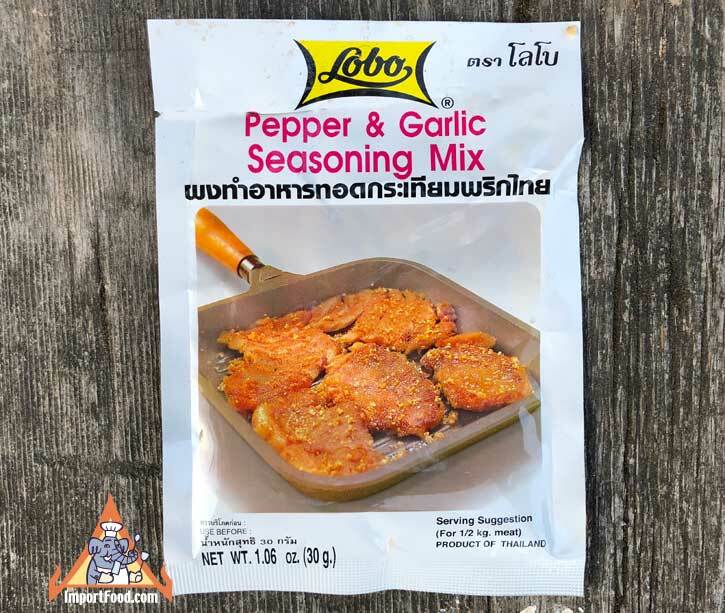 This Pepper & Garlic Seasoning Mix is one of our favorites. Simply add a bit of water and you have a wonderful marinade to use with any meat. We like marinating strips of pork or beef on bamboo skewers, marinading for 30 minutes and cooking. You can also add a bit of honey for a more American flavor. A convenient envelope packet, enough to make one large serving. See picture below, we marinaded pork and barbecued it along with sliced potato and carrot which we'd boiled before. Ingredients: Sugar, salt, soy sauce powder, spices, soybean oil, silicon dioxide as anti-caking agent (no msg, artificial color or preservatives). Product of Thailand.